To be used with Bed rails to help prevent entrapment and reduce risk of injury from the rails. 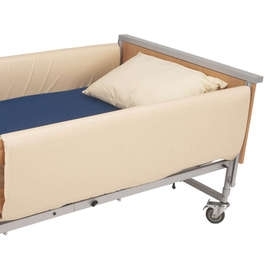 Reduce the risk of entrapment or injury with cot side bumpers. Designed to fit bedrails fitted to beds up to 1400mm (55") long. With a standard height of 760mm (30") these cot sides reach over most bedrails. Can be easily and quickly attached to the rails with a hook and loop fastening along the bottom edge. With a mattress overlay, and foam inner this padding is easy to wipe clean. Sold in pairs.